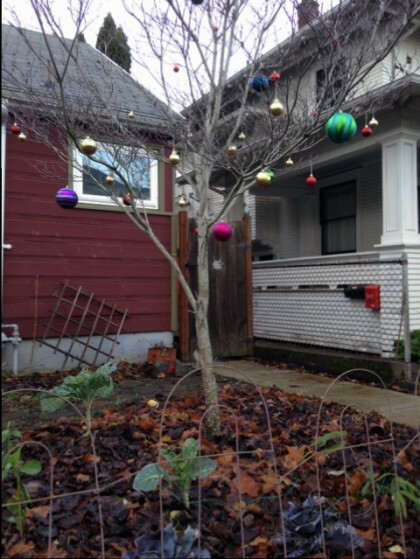 An expression of Christmas spirit in my neighborhood. When I first met the neighbor who is building this nifty zero impact house, she told me about an online community called Nextdoor. I signed up for it in my neighborhood, but haven’t posted anything, preferring instead to read posts that caught my eye and learn from them. On our morning walks, Romeo and I walk many blocks in the area and I always note where the gardens are. At one intersection we sometimes pass, I had noticed a large, rather overgrown garden site. It felt as if many interesting things had once been grown there. We didn’t go that way for a while. The next time we happened to pass it, it had a construction fence around it. Sadly, I noted, it was not likely that the willow arches adjoining it to the yard next door would be part of the game plan to keep the properties connected. In the following weeks my hunch was borne out. The foundation was being dug out almost right up to the arches. There would be no place for neighbors to walk back and forth to visit each other. So when I noticed that the address of this intersection had become a topic of discussion on Nextdoor I decided to follow along. It has become a wide ranging discussion on issues of home ownership, growth and development in Portland proper, mostly carried on by folks who own houses I will never be able to afford, let alone remodel. But I have learned a lot. “Hi, I moved to Portland this Spring to be near my son and daughter-in-law and this Summer I was able to purchase a one bedroom condo (circa 1950) on the border of the King and Vernon neighborhoods. I have MS and don’t drive, but my service dog and I walk all around and I started following this topic because I recognized the intersection as one I’d walked by, and had noted that a long standing garden had become a construction site. It felt sad to see there had obviously been a passageway from the yard next door into this garden but that the new layout would not include that interconnectedness. I hoped to learn more about what people feel and think about all these sites I walk by, and what the issues are. I didn’t think I would be adding anything, but now I’d like to respond from a slightly different perspective. In Vernon and King, there are quite a few PCRI (Portland Community Reinvestment Initiative) rental homes. I have become friends with a neighbor who lives in one of them. Decades ago, she lived in the house that once stood on what is now The Emerson Street Garden, a sweet little haven of soil reclamation and community building in the midst of all the development. (Blog readers, if you click on the hyperlink and scroll down a ways you can listen to my neighbor read her memories about living in the house that was there so long ago.) Recently we took a walk together, hoping to see the Christmas tree lighting on Alberta, but I had gotten the date wrong and we were a day early. Nevertheless, our walk together will always be one of my most memorable holiday experiences. To begin with, on the way, we walked by a house and she exclaimed “That’s where I lived with my sister in 1968!” When we got down to the plaza at Umpqua Bank where the tree lighting was supposed to take place, the tree was there, but nothing was happening. So I suggested we go in the bank and ask. Since it isn’t her bank, my neighbor had never been in there. “Wow,” she said, “This is a real trip being in here.” The reason it was such a profound experience is that her brother used to have a church there on that corner in an old theater building. He’s now passed away, and of course the building and the church are long gone. On our way home we wandered off Alberta Street and my neighbor pointed out another house that a dear friend of hers lived in a long time ago. We talked about Christmas when we were young. My neighbor told me her father’s birthday was December 24th, and when they were growing up in Texas, he’d always eat a big slice of the coconut cake their mom made and leave a note that “Santa” ate it. I had a similar story of my Dad eating the Italian cookies we helped my Mom make and marveling as a little girl at how oddly similar Santa’s writing was to my Dad’s careful engineer’s printing. I learned that she and her siblings never knew December 24th was their Dad’s birthday until much later because they never had the money to celebrate it. But later her Dad would say that he came on the 24th so he wouldn’t miss Christmas. As children they had little money and so Christmas was the cake, oranges and maybe a little doll. As we wandered this way and that between Alberta and Killingsworth, we came upon a little house on a corner I have always liked. My neighbor gasped and smiled and clasped her hands to her mouth. “This is where my Mom used to live! !” she exclaimed. We walked all around it and she told me all about her mother’s garden, everything she grew, and that her name was Celeste. My neighbor remembered “during the time of drugs” that her mother had had the pluck to go out and tell crack dealers to quit leaning on her fence. Her grown kids had begged her not to do that again. She lived to be 91. I loved hearing about what the house used to look like compared to its new additions and what the original color had been. It was obviously a place of happy memories for my neighbor, despite how rough the neighborhood had been at times. I told my neighbor I felt her Mom smiling down on us, pleased we were talking about her and her garden. During our walk, we also encountered a couple of street people asking for help with spare change. My neighbor knew where one of them used to live with her mother, and that she was mostly always now strung out on crack. As we passed Living Room Realty, she noticed they were stringing lights on a tree in their front window. “There’s our lighted tree,” she said, and we cracked up. We stopped at the Co-op and I showed her where the apple cider vinegar was because she wanted to buy some. We stopped at Candy Babel and talked with the Danish owner about what she likes best about the US and what she thinks needs the most work. The way people love their dogs is one of her favorite things, but the way we treat the homeless and what we have to pay for education are not. I did after all, attend the tree lighting at the plaza on Alberta Street, which was the following night. My neighbor was invited to a play, so Romeo and I walked down solo. The plaza was filled with mostly young parents and their young children, eating pastries and drinking cider, awaiting their photo opportunity with Santa after the tree lights came on. Near the tree Santa and someone from the Alberta Arts Commission attempted to lead the crowd in Santa-centered Christmas carols, which many of us gave our best to, but the atmosphere never changed from that of a noisy cafe where people are all talking and eating and not paying attention together to anything. I was disappointed and underwhelmed. It was nice to see the tree lights come on, but I felt an opportunity had been missed. Here we all were in the same place, at a time of year when we look forward to the return of the light, and the hope for peace and good will toward one another should be strong. Instead it felt like we couldn’t get beyond football scores or being seen at the right place and time. I wanted to leave, but I stuck it out until the lights came on. A man had been shot and critically injured just another block down a few weeks before. Perhaps it was this stored knowledge that helped prompt me to sing to myself what I wished we had all sung together: Let There Be Peace on Earth. Somewhere in our neighborhood his family is not having the happiest holiday season. No one heard me above the din, but I finished the song anyway. And then it was time to head home. I was glad I had gotten the date wrong, and that the previous evening my neighbor and Romeo and I had had our own truly wonderful neighborhood walk–full of lights coming on in the windows and on houses and trees, and the special light of sharing loving memories and new experiences together. It was an evening of genuine place-making. I wish you all the gift of sharing with a new friend in your own neighborhood this season. Oh Maria, this essay was so beautiful (on several levels) that it moved me to tears! No one can put into words their feelings and observations the way you do. I hope that the Nextdoor community realizes how lucky they are to have you among them. What a treasure your first posting is – truly a bright Christmas gift. I could vividly feel what a disappointment your neighborhood tree-lighting ceremony turned out to be & what a sad opportunity was lost. Thank goodness for the delightful evening with your neighbor the night before. Yes, hopefully your wise & thoughtful words gently reminding others to honor your neighborhood’s history – and respect everyone equally – will be heard. I also want you to know that your Blue Wheelbarrow chalk drawing is amazing!! What a real talent you are!! Thank you so much, Deborah, for all these kinds words about my post. I am so happy you felt it so vividly because it was important to me to try and share the experience on a larger level. I think the folks on Nextdoor will most likely continue their debate about what should be allowed in construction and remodeling, but a couple of people and thanked me and one wrote it is the best thing she’d ever read on Nextdoor. 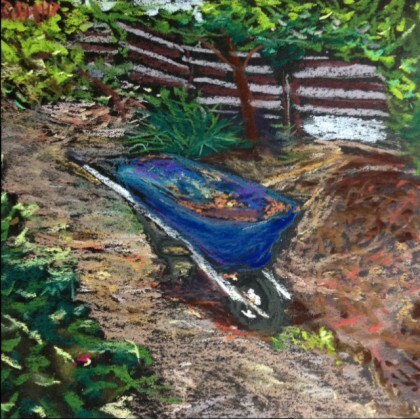 🙂 I am especially pleased, too, that you love the drawing of the Blue Wheelbarrow. I just love that old wheelbarrow in the Emerson Street Garden and am very happy to share it this way with others. Beautiful story, Maria! It’s amazing how a simple walk around the neighborhood with a new friend can be so good for the soul. I’ve begun to meet new people in our neighborhood, too, and hope to bond with them over walks, or just gardening in the yard. Yes, indeed, Veronica. Thank you for expressing these sentiments so eloquently. Wishing you the warmth of your new neighborhood friendships!! This is a beautiful story, Maria, one that is ideal for the holiday season, when (I think) it is especially important to keep good tidings and warm feeling towards our brethren in mind. I’ve sort of careened through the holidays this year–a combination of getting sick repeatedly and being “busy” (a word I’m starting to dislike. It makes me sad, because this season is very dear to me. Reading your posts are important, because I think you have a special way of slowing time and noticing things. One of my favorite comments you left on my blog was to do with the word “wander” (you referenced “I wonder as I wander,” a song that I love), and I often find that your blog posts evoke themes of wandering, literal and figurative, so that you can take the time to see subtle connections and allow lessons to take shape. This post is a great example: I loved following the arc of your feelings. It is inspiring to me, and it is a reminder that I can slow down a little in the hopes of allowing similar revelations to unfurl.